sunset boulevard | You may clap? Bette Davis, easily one of the best-known stars of the 1930’s through 50’s, was only 54 when she made the frightening film What Ever Happened to Baby Jane? which acted to revitalize her career after a short lull. Her transformation from big-eyed beauty to beastly spinster is so terrifying that it really gives a whole new perspective to the phrase “Bette Davis Eyes.” The question I asked myself multiple times during my screening of the movie, though, was, “Is this horror? Or just depressing?” It certainly doesn’t meet the requirements that we normally think of when we think of “scary movies.” There are no monsters (or are there), no gruesome attacks (not exactly), and I certainly never screamed with terror. Upon looking up the definition of horror, though, it’s defined as: an overwhelming and painful feeling caused by something frightfully shocking, terrifying, or revolting; centered upon or depicting terrifying or macabre events. That said, I suppose this does qualify as horror, it certainly was horrific to watch and it absolutely shocked. The film is about two aged Hollywood sisters who live alone in their equally aged house. One sister, movie star Blanche Hudson (Joan Crawford), is confined to a wheel chair from an infamous and somewhat mysterious car accident that we see early in the film. The other sister, Jane “Baby Jane” Hudson (Bette Davis) is her eccentric caregiver. Poor Jane was a child vaudeville star who never found her footing in the movies when she grew older. It’s a sad picture before Jane goes bonkers. It’s a horrifying picture once she does. While both sisters battled severe jealousy towards one another at various points in their lives, it seems Jane’s fall from stardom effected her more than Blanche’s. She’s trapped in the child-like world of Baby Jane, certain that one day she’ll regain her star status; that is, after she’s rid of her beautiful, annoying, and crippled sister. However, a spoiled child grown into a spoiled and mentally disturbed woman isn’t a charming thing to watch, but rather a frightening one. How can we feel sorry for her psychosis, when she’s raging twisted attack after twisted attack upon poor, helpless Blanche? No, Jane seems beyond help, and Blanche is but the helpless victim. It’s a frigthful depiction of childhood rivalry, turned adult rivalry, turned insanity. You can watch the trailer at the link below. Marked with all of the elements of a psychological thriller with doses of the macabre, I was actually on the edge of my couch rooting for Blanche to break free of her sister’s lunacy. I was shocked, appalled, and yes, rather disturbed by the pathetic place where these two sisters found themselves. I was hoping for Jane to trip up, perhaps even up the stairs while carrying one of those grotesque meals she brought Blanche. Of course, that’s not the formula of horror films, and sadly this one was no different. Bette Davis and Joan Crawford shine as eccentric, loony, bitter, creepy, and altogether cooky fallen stars. I couldn’t help but think of Grey Gardens gone bad. Thank goodness little Edie wasn’t that kind of crazy. Bette Davis’ remarkable performance as Baby Jane reminds us once more of how completely devoted she was to every role she encountered. Practiced in playing the strong-willed beauty, how different it must’ve been for her to play the psychotic old lady, hell-bent on torturing her paralyzed sister. It’s remarkable the way in which Davis flits back and forth between the evil and innocence brought on by whatever personality disorder Baby Jane was experiencing. That moment when we first see her in the oversized Baby Jane costume that matches that of her Baby Jane doll perfectly, is perhaps the most terrifying and telling of all. Can you imagine some of our most recognizable recent child stars jumping into grown-up sized versions of their character’s best-known outfits at age 50? Somehow I picture a grown Urkel running about saying, “Did I do that?” It’s deranged. It’s probably not an uncommon effect of child stardom, though. 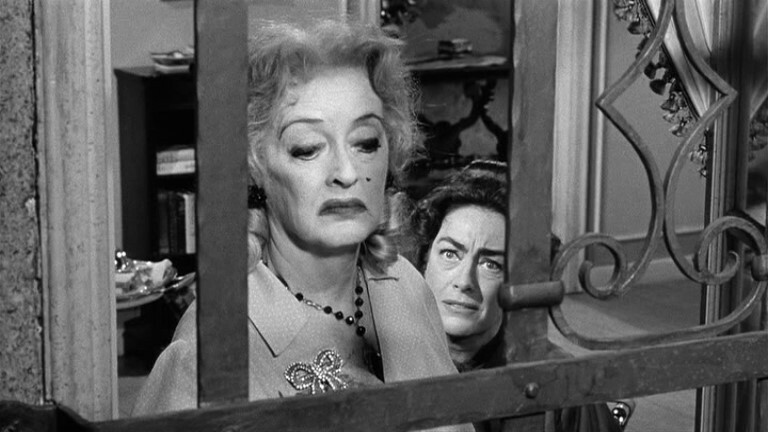 What make the film most horrific, however, is that for some reason Bette Davis’ Baby Jane character takes out all of her twisted regrets on her sister, who’s trapped in an upstairs room with no hope of getting out. This is the part that puts What Ever Happened to Baby Jane?, right on par with any other creepy kidnapper, torture, or serial killer film of today. It takes light, fun places like the beach, and turns them into terrifying reminisces about a childhood long-gone and two sisters on the edge of destroying one another. It makes the viewer go, “Oh God! What can she possibly do to that poor woman now! Make it stop!” It certainly made me do that. 1. If you’re long-standing fans of Miss Davis and Miss Crawford, we warn you this is quite unlike anything they’ve ever done. 2. You are urged to see it from the beginning. 3. Be prepared for the macabre and the terrifying. 4. We ask your pledge to keep the shocking climax a secret. 5. When the tension begins to build, remember it’s just a movie. Here, we get a sense of just how terrifying it must’ve been to see this film in 1962 when it was released, particularly, if you were already a fan of Bette Davis or Joan Crawford. I know it bothered me seeing Davis in such a strange, new light. It was, perhaps, this strange, new light, however, that earned Davis an Oscar nomination for her role as Baby Jane, which she lost to Anne Bancroft for The Miracle Worker. Sadly, had Bette won this award she would’ve made Academy Award history as the first actress to receive three best actress Oscars. According to IMDb, “It was the general feeling among Academy voters that while Davis was superb, the movie itself was little better than a potboiler exploitation film, the kind that doesn’t deserve the recognition that an Oscar would give it.” The film, however, earned four other nominations. Newcomer Victor Buono was nominated in the supporting actor category for his role as Edwin, and the film was nominated for it’s cinematography, costume design, and sound. The only category it won was costume design. A fair win, because as previously stated, some of Bette Davis’ childlike costumes were terrifying! In the photo below you can see her as child standing next to her grown-up self. It gives me the creeps just looking at it. The film was also listed as #63 on AFI’s list of 100 Years…100 Thrills, and Baby Jane Hudson was #44 on the list of AFI’s 100 Years…100 Heroes & Villains. Why did Bette hate Joan, though? From what I read it sounds as if her dislike stemmed from Joan’s constant need to be in character. Bette claims that off-screen she was herself, while on-screen she became whatever the character required. Whereas, Joan was always playing up what Bette regarded as the character of Joan Crawford. Was this true, or not? Hard to say. Odds are that Bette and Joan hated one another (if they did hate one another) because they were just too darn similar. For instance, after Joan’s daughter wrote the deprecating book about her mother titled, Mommy Dearest, Bette’s daughter went on to write a similar book. Both daughters apparently found something in their mothers to detest. Perhaps it was also a bit of jealousy that caused the stars to feud, or at least caused rumors of the feud. While both carried equal amounts of star power, Bette was a trained actress dedicated to her roles, while Joan was the beautiful actress who played into her image as a “star.” They made films for rival studios MGM and Warner Brothers for years, then Joan jumped over to Warner Brothers where Bette was. In an interview from 1987, which you can watch at the link below, Bette claims the two women got along just fine. Whether that’s true or not is another question, but in 1987 all seemed to have been well. 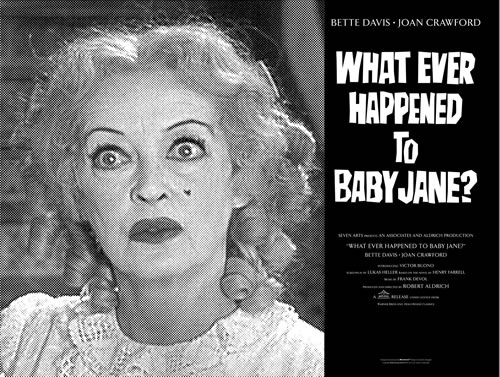 In another interview, Joan Crawford talks about her time working on What Ever Happened to Baby Jane? She talks briefly about her feud with Bette, and gives a few more interesting insights into the making of the film. Who’s to blame/thank for the film’s greatness or lack there of? This was an all-around group effort of awesomeness. Bette Davis giving an amazing performance is a no-brainer. Joan Crawford’s performance, though, is not to be ignored. If we hadn’t believed 100% in her fear, then the film would’ve been cheesier than it was terrifying. No, she deserves a fair amount of credit for her fabulous performance as well. Director Robert Aldrich was spot-on in the way in which he builds up the horror and the characters. He’s definitely a director I want to look into now. Here’s a nice behind-the-scenes gem I found about him and the making of the film. Why I watched this film in the first place? Believe it or not, my mom actually recommended this to me when I mentioned I was planning on watching scary movies this month. It was the first thing she thought of. I guess it scared her so much as a young teenager, that she wanted to share in the terror. Thanks Mom. Okay, so this falls into that weird niche of horror like Psycho or The Orphanage (which isn’t an old movie, but one that I’d highly recommend) where it’s the freaky images that stick with you more than anything else. It holds up its end of suspense as well just like Rear Window or the original House of Wax. If you liked Bette Davis in this and aren’t familiar with her, please find a copy of All About Eve to watch right now, then watch anything else by her and enjoy. 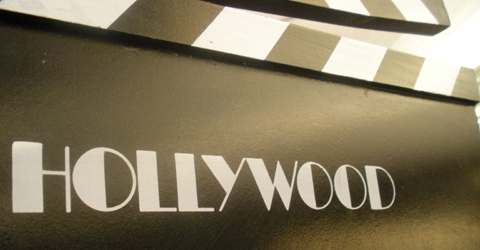 If you like the idea of fallen celebrities, then Hollywood has no shortage of great films about that. Amongst those I’ve seen Sunset Boulevard and Grey Gardens are the best. All About Eve dances around that same topic as well. 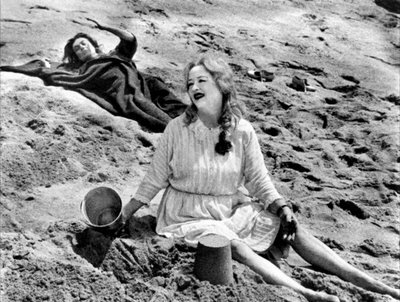 You may clap as Baby Jane dances around in circles at the beach, perhaps for the last time. She’ll think you’re clapping for her, when in reality you’re clapping at the sheer genius behind making this film seem so darn creepy and real.